Sealaska Heritage Institute (SHI) will sponsor a lecture on the partnerships between scientists and Alaska Natives that emerged in an effort to map Alaska after the United States acquired the state through the Treaty of Cession in 1867. 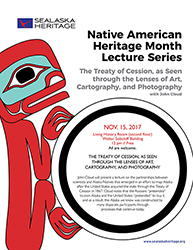 The lecture, The Treaty of Cession, as Seen through the Lenses of Art, Cartography, and Photography, will be given by John Cloud, an independent historian of geography and cartography whose foundational research related to Alaska was largely funded by the National Oceanic and Atmospheric Administration (NOAA). Alaska Natives have long disputed the federal government’s “purchase” of Alaska from Russia, arguing the indigenous people were the original owners and they did not consent to the sale. In an abstract about his talk, Cloud notes that the Russians “pretended” to own Alaska and the United States “pretended” to buy it, and as a result, Alaska was constructed by many disparate participants through processes that continue today. NOAA (formerly known as the Coast Survey) collaborated with many Alaska Natives across the state to map, document and photograph it, Cloud wrote. The collaboration produced a large volume of materials, including hand-drawn maps, painted sketches, photographs, ethnographically significant objects and photos of the objects, ethnographic descriptions and monographs, reports and thousands of Native place names. “Only fragments of these stories are known in Alaska, mainly because the materials produced through the collaboration soon left the state and never returned. Now, through archival research conducted across the country, these materials and the stories they tell can return,” he wrote. The free lecture, which is sponsored by an anonymous donor, is scheduled at noon on Wednesday, Nov. 15, at the Walter Soboleff Building in Juneau. Everyone is welcome.